Does The Sleazy Politics EVER end? Lobbyist Ron Dotzauer has been claiming for weeks that he too is about to file a "liquor privatization" initiative. So far, only bluster. Nothing filed yet. But it's apparently not genuine privatization, but a cynical maneuver designed to confuse voters and hamper Modernize Washington, a legitimate privatization initiative. Dotzauer is apparently working for the liquor store employee union and a few middlemen who supply booze to the state monopoly. Their objective would be to maintain the current (lucrative for insiders) system, while offering some sham symbolic "reform" to answer public demands to get the state out of the liquor business. Dotzauer's colleague Charla Neuman slipped a hint to a blog tied to government employee unions, saying their initiative would "privatize state liquor sales, or at least reform them." What Have We Learned In The 2,064 Years Since The Roman Empire? I just had a great meeting with Jill Jean and Jeff Brody from the Kitsap Regional Library. We found the common ground we needed to create a win-win-win for the City, KRL and the citizens of our City and County. There's still work to be done, but there is a solid understanding of what each party needs to make this work, and a commitment on all sides to get us there. • The library is proposing a $33 million, 10-year Levy This means, that there won't be ANY additional money available for upgrading library facilities until at least 2021 — and probably beyond, depending on whether or not KRL runs another Levy — and when. • According to the sheet KRL officials distributed at last night's Council Work Study, they are proposing to spend $7.75 million of that money on a building they own in Silverdale, and $3.4 million on one they DON'T own in Kingston. • The TOTAL amount of money they are proposing to allocate to Port Orchard over the 10-year period of the Levy is a MAXIMUM of $750,000, but more likely, $500,000 over a five-year period. • Meanwhile, they expect the City to build them a brand new, 10,000 sq.ft. facility as part of the Towne Center Revitalization Project, and expect the taxpayers of Port Orchard to foot the bill, while giving Silverdale and Kingston residents a free ride. That's simply unacceptable — and quite frankly, a blatant insult to the citizens of South Kitsap. The City of Port Orchard has worked with KRL in good faith to keep them downtown — at their request. We turned down the opportunity to actually sell their current City-owned waterfront facility — which is much better suited to be remodeled into high-dollar commercial space — to a willing cash buyer that would have generated a substantial amount of new and ongoing sales tax revenue for the City. The City receives no revenue from KRL. That buyer confirmed to me this afternoon that they remain ready and willing to purchase that facility at market value. This would mean moving the library out of that facility to another within the City limits. While a downtown location couldn't be guaranteed, Givens Center comes immediately to mind. Frankly, as Mayor, I feel that KRL has stabbed the City in the back, after we have bent over backwards to help them and accommodate their desire to remain downtown. South Kitsap and Port Orchard are the fastest growing parts of Kitsap County, and are projected to be for years to come. We currently have more than twice as many residents as Kingston, nearly as many as Silverdale and Central Kitsap, and have a demonstrated need for at least an equal share of that Levy money as either Kingston or Silverdale. Additionally, the residents of Port Orchard — whether they annex into the Library District or not — will be helping to pay for those new facilities in Kingston and Silverdale for the next 10-years. Meanwhile, we derive NO direct economic benefit, while being taxed to help other communities — much like we're already doing with the Port of Bremerton tax for the Bremerton Marina. Enough is enough — It's OUR turn. If you live in South Kitsap and you agree this is blatantly unfair, and that the KRL Board needs to rework their Levy proposal, contact KRL Executive Director Jill Jean at jjean@krl.org. The guy sitting in the row in front of these two is on Facebook, while the guy behind Hennessy is checking out the baseball scores. I try very hard to give the folks running our government the benefit of the doubt. It's very difficult, and I realize that it's probably futile in the end, but I do it anyway. On Tuesday, Treasury Secretary Tim Geithner provided fresh support for the devil on my shoulder, who tells me to just assume that most government officials have precisely no clue. In an op-ed in The Washington Post, Geithner showered support on the financial reform package highly in favor of financial reform, and would admittedly rather see something happen than nothing, I'd hoped that high-profile figures like Geithner would speak out on the areas where the Senate bill still falls far short. introduced in the Senate, and urged lawmakers to push it through into law. Instead, we get an op-ed that does nothing to move us toward good, comprehensive reform. Let's take a closer look at what he had to say. "The best way to protect American families who take out a mortgage or a car loan or who save to put their kids through college is through an independent, accountable agency that can set and enforce clear rules of the road across the financial marketplace." This comment makes me wonder whether the Treasury Secretary has higher political ambitions. I've complained in the past that politicians' pandering to voters about those mean and nasty financial institutions has been a bit over the top. Were legitimate abuses and predatory lending going on? Sure, but this is hardly the top concern when it comes to preventing the next financial crisis. "As the Senate bill moves to the floor, we must ... push to make sure the government has real authority to help end the problem of "too big to fail." Last week I criticized Paul Krugman for pooh-poohing the "too big to fail" issue, but here Geithner has done the exact opposite — treated it like a silver bullet, while ignoring potentially more important issues. Key among them is the dilemma that Krugman (and I) highlighted: The "shadow banking" industry needs regulation. Lehman Brothers was able to put itself in line for a world of hurt by using ultra-short-term lending to lever itself up to untold heights — quite literally, thanks to the "repo 105s." While much of Lehman is (hopefully) safely tucked away inside Barclay's, quasi-banks such as Goldman Sachs, and Morgan Stanley were doing many of the same things that Lehman was. And while Citigroup, JPMorgan Chase, and Bank of America have a steady base of deposits, they do plenty of business in those shadow markets as well. "To prevent large financial firms from ever posing a threat to the economy, the Senate bill gives the government authority to impose stronger requirements on capital and liquidity. It limits banks from owning, investing, or sponsoring hedge funds, private equity funds or proprietary trading operations for their own profit unrelated to serving their customers." It would be really great if this were all true. Unfortunately, it's not. Geithner is correct that the bill "gives the government the authority" to do more cracking down on banks. However, giving the authority is all it does — the rest is left up to the potentially fickle judgment of whoever's doing the regulating at the time. As for the rest of it, Geithner is suggesting that the Senate bill actually puts the so-called "Volcker Rule" — which limits certain banking activities — in place. In reality, the bill is squishier than SpongeBob on the subject. It merely requires that the government conduct a study to figure out what the impact of such regulations would be. And while the bill mentions regulators' ability to crack down on non-banks like AIG, that still remains a very cloudy area as well. "This is a defining moment for financial reform. We have to get it right. We cannot build a system that depends on the wisdom and judgment of future regulators. Even the smartest individuals armed with the sharpest tools will not be able to find every weakness and preempt every crisis. Instead, the best strategy for stability is to force the financial system to operate with clear rules that set unambiguous limits on leverage and risk." While this tough talk may sound very Rocky-takes-on-Apollo-Creed, it made me wonder whether Geithner has actually read the bill he's talking about. Most of the major reform areas dealt with in the bill are addressed by giving some council or agency or supervisory board new powers to oversee what goes on, and slap wrists as it sees fit. As far as I've seen, there are almost none of the "clear rules" that Geithner seems to think are so important. Alas, I've crossed one more public official off my list of the folks I hope will speak out for stronger and more effective reform. But that's just my opinion. What do you think? Is the Senate bill all we need to get the system back on track? Jason Levin of Portland, Oregon is said to be the organizer of this group. He has written on his twitter account that Michelle Malkin wrote about the group on her blog earlier today. One question remains, though. 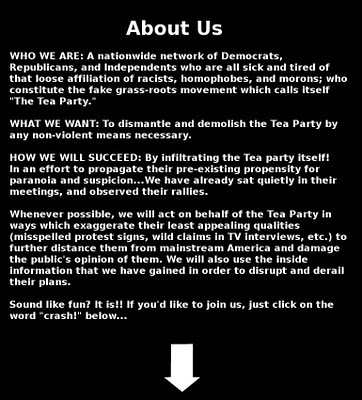 if Mr. Levin and his comrades need to fabricate hateful rhetoric at tea party protests, does that not mean that liberals like himself cannot find racist rhetoric at these events to begin with? Furthermore, he has just discredited any accusation of racism toward tea party activists by admitting he wants to smear the movement with his group's explicit intention of lying about themselves and tea party activists to the media. ObamaCare sweeps away a host of state regulations and permanently alters our state’s insurance market. From now on, the federal government will manage the health care of all Washingtonians. The 2,700-page law contains a complex web of mandates, directives, price controls, tax increases and subsidies. Federal officials will now decide what kind of insurance people in Washington must have, what medicines will be covered, what treatments are allowed and which are not. Early reports indicate, however, that President Obama, Vice-President Biden, the cabinet, senior members of Congress and leadership staff are exempt. The new law falls well short of universal coverage. ObamaCare will leave about 6 percent of Washington residents without coverage. The measure is conservatively expected to cost $2.4 trillion in its first full decade. Thousands of older Washingtonians will lose their Medicare Advantage coverage, and the state’s 120,000 Health Savings Account holders may need to buy new policies or face stiff penalties. Washington residents will begin paying ObamaCare taxes this year, while most benefits don’t start until 2014. The law includes some 19 new taxes — here’s a rundown of what Washingtonians can expect in the coming years. • Penalties on individuals: Individuals will pay a yearly penalty of $695, or up to 2.5 percent of their annual income, if they cannot show they have purchased a government-approved health policy. • Penalties on families: Families will pay a yearly penalty of $347 per child, up to $2,250 per family, if parents cannot show they have purchased a government-approved policy. • Penalties on employers: Business owners with more than 50 employees must buy government-acceptable health coverage, or pay a yearly penalty of $2,000 per employee if at least one employee receives a tax credit. • Tax on investment income: ObamaCare imposes a 3.8 percent annual tax on investment income of individuals making $200,000 or more and on families making $250,000 or more. The new tax is not indexed to inflation, so more people will fall under it each year. Seniors on fixed incomes and people with IRAs and 401(k) plans will be hit particularly hard. • Tax on “Cadillac” health plans: Starting in 2018, imposes a 40 percent annual tax on health care plans valued at $10,200 for individuals and $27,500 for families. • Medicare tax increase: Requires single people earning $200,000 or more and couples earning $250,000 or more to pay an additional 0.9 percent in Medicare taxes. • Tax on Home Sales: Imposes a 3.8 percent tax on home sales and other real estate transactions. Middle-income people must pay the full tax even if they are “rich” for only one day — the day they sell their house and buy a new one, if the profits push their adjusted gross income above the yearly limits. • Tax on medical aid devices: Creates a new 2.9 percent tax on medical aid devices. Certain items intended for personal use are exempt. • Tax on tanning: Imposes a 10 percent tax on services at tanning salons. Business owners will collect the tax from customers and send it to the federal government. This appears to be the first federal sales tax in the United States. ObamaCare will be enforced by the IRS. The tax agency plans to hire 16,500 new auditors, agents and investigators, and to increase enforcement audits. The IRS can confiscate tax refunds, place liens on property and seek jail time if health-related penalties and taxes are not paid. President Obama had said people could keep their coverage if they want, yet the Congressional Budget Office estimates that under ObamaCare eight to nine million people will lose their employer-provided coverage. The ObamaCare law passed over bi-partisan opposition in Congress. Republicans say they will run on a “repeal and replace” platform this fall, and Washington has joined 12 other states in a lawsuit challenging the federal government’s power to force state residents to buy a product — insurance — from private companies. The long-term prospects of ObamaCare are unclear. In the meantime, Washingtonians should prepare for major changes in their tax burden. As promised below, here is the second editorial, this one from the Seattle Times. It seems to me to be the first time in recent memory that the Times has actually supported anything pro-business. The Seattle Times editorial board says the Democratic majority in the Washington Legislature seems primed to raise taxes far too much in a recession. WE want to take the Legislature by the lapels and shake it. The Democrats particularly. The taxing and spending plans now running free in Olympia are their plans, and mostly bad ones. Washington has been a charmed corner of America. A high-wage corner. We like it that way. But this region's future is not guaranteed, and as we look south, to California, we are not comforted. California was a charmed corner too, and it is a mess. The state's credit is in the dump. Its business people flee to Nevada, Utah, Idaho and here, as refugees. Democratic leaders should be focusing on the repair of this state's private sector. Instead they focus on protecting state employees and beneficiaries. Gov. Chris Gregoire proposes $605 million of tax increases — about double the right amount, we think — and leaders such as Ed Murray, D-Seattle and chairman of the Senate Democratic caucus, Rep. Ross Hunter, D-Medina and chairman of the House Finance Committee, talk of increases as high as $900 million or $1 billion. This is a failure of leadership. Hunter, in particular, disappoints us because he was supposed to be a moderate. Nine hundred million dollars is not moderate. Legislators' concern should be for the people's ability to work, to earn, to create wealth. 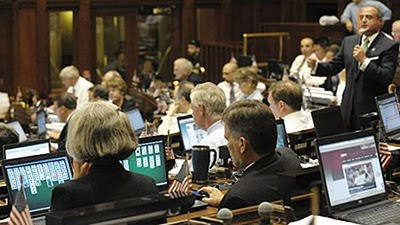 Legislators should be focusing on lightening the burden of the state by culling the highest-paid state employees, freezing the highest-cost pension plans, reopening labor contracts, privatizing the liquor stores, disbanding the state printer, releasing certain middle-aged and elderly prisoners, closing optional social programs such as General Assistance Unemployable and culling the unqualified from the rolls of other programs. Instead of these things, legislators now propose taxes on bottled water, pop, candy, cigarettes, pipe tobacco, gasoline, diesel, fertilizer, pesticides, collector coins, private aircraft, corporate directors' pay, canned food with meat in it, coal used in power plants, out-of-state banks offering credit cards, the estates of dead people and the income and retail purchases of live people. They also propose to jack up fees on interior designers, midwives, tanning salons, nursing homes, appraisal companies, wetland scientists and for ballot initiatives, water rights and deeds of trust. Not all of these will be enacted — and thank God. A few we have endorsed, such as taxes on out-of-state banks and on directors' pay. This page stands firm for the state's first and best social program: education. But the bulk of the state's financial problem has to be met by cutting what it spends. The state is not the federal government. It cannot print money or borrow from China. It has to adjust. The private sector has done so. The state must do the same. Rumors that Dino Rossi would announce a run for the U.S. Senate on Monday had become too loud to ignore Friday, so I called him to find out. “Hold on,” he said as he ordered a fish sandwich and a diet soda at a fast food drive-through in Everett. Sustenance, I asked, for an afternoon strategy session for the big campaign? Nope, lunch before church, he said. It was Good Friday. I promised to be brief, then broke my promise because, well, Rossi is engaging and if he does become the next U.S. senator he might change his phone number to block pestering calls like mine. About the latest rumor of his pending declaration, he laughed and said he will be in Canada on Monday with his family for spring break. What about the Monday following your return, I asked? No comment, though I'm sure he smiled. “A whole lot of people have a whole lot of designs for my life,” he said. “I know I have to do it before 5 p.m. June 11.” That's the deadline for candidates to file for the race. Those people are in the national Republican and Democratic parties whose gazes are fixed on Rossi for the same reason: As the political world pivots today, he is the best-known Republican with the best chance of beating Democratic Sen. Patty Murray in the fall. Two of three published polls done this year show Rossi and Murray statistically tied, with the third showing Murray comfortably, though not convincingly, ahead. Obviously two bruising gubernatorial setbacks did not undermine Rossi's foundation of support. Comparatively, each of the nearly dozen declared Republican challengers fails to register high enough in any poll to make the incumbent senator miss a breath. It explains why the Republican Party flew Rossi to Washington, D.C., last month so those in the GOP brain trust could try to convince him to run. “I'm still not saying no, and I'm still not saying yes,” Rossi said. Seeing Dino Rossi wandering around the nation's capital in the company of Republican leaders made Democrats' knees bend. That party's strategists have parsed the public polls and compared them with their private surveys and know this could turn out bad, very bad, for Patty Murray if he runs. Considering the mood of voters today is a bit sour toward those in charge in Washington, D.C., and the direction they are leading the country. Murray is one of the power brokers helping steer the nation. 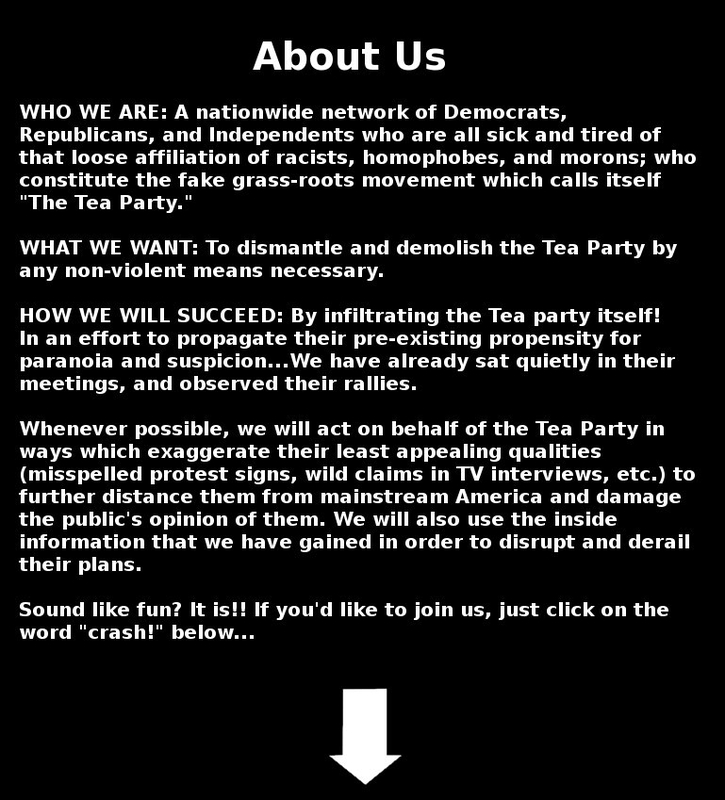 Also consider Republicans are an enthusiastic bunch right now fueled by anger over issues such as health care and energized by the rebellious souls in the tea party movement. In such conditions Murray's vulnerability is real — not as real as Senate Majority Leader Harry Reid in Nevada or Sen. Barbara Boxer in California — but enough to make her friends alert. That alertness quickly morphs into worry if Rossi is the opponent. That's why the Democratic Senatorial Campaign Committee went on the attack this week, launching a Web site of insinuations of shadiness about the company Rossi keeps and deals he's made in the business world. Most of the content is regurgitated from Democratic campaigns against Rossi in 2008. The mission of the group, which Murray ran in 2002, is to elect Democrats to the Senate and re-elect those there now. By any means necessary. Right now, it's with psychological warfare. They want to scare Rossi out of the race before he gets in. They want him to know that he is in for a fierce and unrelenting battle unlike either of his bids for governor. Actually, she's not, but those paid to sustain the Democrat majority are nervous. They figure the best defense is a good offense and won't stop unless Rossi decides not to get into the race. Everyone will know the answer soon. Not Monday. That was a bad rumor. Reach political reporter Jerry Cornfield at 360-352-8623,or jcornfield@heraldnet.com.